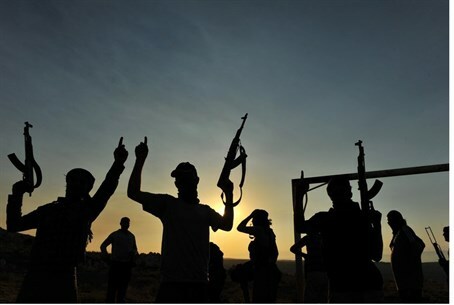 Powerful armed groups in Syria say that negotiating with the regime would be an act of betrayal. Powerful armed groups in Syria said on Sunday that attending peace talks or negotiating with the regime would be an act of betrayal, AFP reported. The joint declaration by the 19 Islamist groups fighting to topple President Bashar Al-Assad cast further doubt on whether the long-delayed peace talks dubbed "Geneva 2" will actually go ahead. It comes as the UN-Arab League peace envoy to Syria, Lakhdar Brahimi, prepares to travel to Damascus on Monday, according to pro-regime newspaper Al-Watan. "We announce that the Geneva 2 conference is not, nor will it ever be our people's choice or our revolution's demand," the groups said in a statement read out by Suqur al-Sham brigade chief Ahmad Eissa al-Sheikh in a video posted online. "We consider it just another part of the conspiracy to throw our revolution off track and to abort it," said the statement, according to AFP. The 19 rebel groups warned that anyone who went to such talks would be committing "treason, and ... would have to answer for it before our courts." The statement comes weeks after dozens of major insurgent groups across Syria said the Western-backed opposition umbrella grouping, the Syrian National Coalition (SNC), had "failed." The Syrian National Council, a key group within the SNC, had said it would not attend proposed peace talks in Geneva and would quit the Coalition if it participated. This group was later followed by nearly 70 rebels groups which declared that the SNC had failed and announced they no longer recognize the Western-backed group. Last week there were conflicting reports on whether a date had finally been set for the long-delayed conference. Arab League chief Nabil el-Araby said that Brahimi informed him that the talks will convene on November 23. Brahimi, however, denied that any date has been set. The Geneva talks slated for next month aim to bring rebel and regime representatives to the table in a bid to seek a negotiated end to the Syrian conflict, which is estimated to have killed more than 115,000 people since it erupted in March 2011. The National Coalition is to meet on November 9 to decide whether to take part in the peace talks but has stated emphatically it will only attend if there are guarantees Assad will step down. Assad, for his part, has said "the factors are not yet in place" for such talks, and he has repeatedly rejected negotiations with any group with ties to the rebels or to foreign states. The cracks within the rebel groups have escalated into full-blown fighting as the more moderate rebel groups are being attacked by jihadist rebel groups. The 13-member Islamic Front for the Liberation of Syria, which split off from the Syrian National Council opposition force, declared the city of Aleppo to be an independent Islamist state months ago. In addition, there have also been numerous clashes between Arab rebel groups and Kurdish militias in the north of the country.